Provider: Church & Dwight Co., Inc. 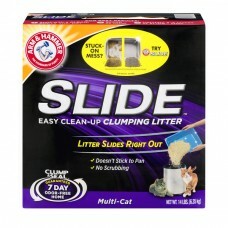 Arm & Hammer™ Slide™ Easy Clean-Up Clumping Litter Multi-Cat. The standard of purity. Stuck on mess? Try slide. Dramatization reflects cleaning after 24 hours. Litter slides right out. Doesn't stick to pan. No scrubbing. Clump&Seal™. Guaranteed. 7 day odor-free home. Net Wt. 14 lbs. (6.35 kg). I❤ My Cat & Slide™ easy clean-up clumping litter. Fellow cat lovers like you put their trust in Arm & Hammer™. See how quick and easy clean-up can be! Visit us online for: Product information. Reviews from cat owners who have made with switch! Have you tried our revolutionary, new cat litter? Be sure to tell us how it feels now that clean-up is a breeze. You may never have to scrub or scrape the litter box again! Our patented formula with EZ Clean Technology* means used litter slides right out. Stuck-on messes slide out easily, and that means no scrubbing, no scraping, no odor - no problem! Extra strength formula for Multi-Cat homes. The Clump & Seal™ guarantee. Completely seals odors. Destroys odors. Rock-hard clumps. Dust free. Like all Arm & Hammer™ Clump & Seal™ products, this advanced clumping litter forms and odor-containing seal around urine and feces. Then powerful odor eliminators and Arm & Hammer™ Baking soda destroy sealed-in odors on contact. For over 165 years, Arm & Hammer™ products have provided a safe and effective way to help keep things smelling fresh and clean. An odor-free home starts with Arm & Hammer™. Made with U.S & foreign ingredients. US Patent 8,720,375, and *Patent pending. If you're not completely satisfied, we'll refund your purchase price. how2recycle.info. Questions or Comments? Call us toll-free at: 1-800-524-1328. Monday-Friday 9am-5pm ET or Visit our website at: www.clumpandseal.com. For best results: 1. Start with a clean, empty litter pan. 2. Scoop as usual. 3. Maintain 3-4 inches of Slide™ litter. Instructions for use: 1. Fill a clean, empty litter box with 3-4 inches of Arm & Hammer™ Slide™ Easy Clean-up clumping litter. 2. Litter seals in and destroys odors, forming rock-solid clumps. Remove clumps and solid waste daily to keep the rest of the litter fresh. Add more litter to replace what you have scooped out and maintain a depth of 3-4 inches. 3. As needed, empty the entire litter box. With our EZ clean technology, litter pours right out! No scraping or scrubbing. Dispose of used litter in trash.